Space is not a static, inert thing. Space is alive; space is dynamic; space is imbued with movement expressed by forces and counterforces; space vibrates and resounds with color, light and form in the rhythm of life. Hans Hofmann Papers, Archives of American Art, Smithsonian Institution, Washington, D.C.
One avenue through which Hofmann explored this burgeoning interest in architecture was muralism. 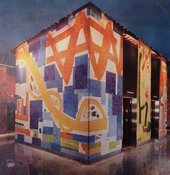 In the years just before and during his development of the slab paintings, Hofmann collaborated with architects on three different mural projects. 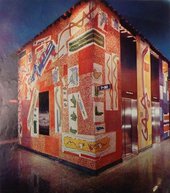 These murals – planned for a Peruvian plaza, an office lobby and a public school – were part of a broader interest in muralism among abstract painters of the 1950s and 1960s. The new mural interest spanned abstract styles (geometric, lyrical, gestural) and milieux: the abstract expressionists, the School of Paris and former Bauhaus figures in the United States all explored muralism at mid-century. At Harvard’s Graduate School of Design, architects Walter Gropius and Josep Lluís Sert ensured that new campus buildings included abstract murals by Hans Arp, Herbert Bayer, Joan Miró, Costantino Nivola and Mark Rothko. Abstract wall paintings also proliferated in the beach houses and suburban homes of Long Island in these years, where murals by Le Corbusier, Fernand Léger, Norman Lewis, Nivola and Jackson Pollock, among others, graced the walls of modern structures. In New York City, much abstract mural production in the early post-war years depended on the organisational energies of New York gallerist Samuel Kootz, whose 1950 exhibition The Muralist and the Modern Architect crystallised the nascent phenomenon (fig.4). The exhibition, which showcased collaborations between the gallery’s stable of artists and a host of eminent modern architects, served as Hofmann’s introduction to the mural form.3 Kootz would also go on to play a decisive role in Hofmann’s next two mural projects. Hofmann’s engagement with murals was relatively short-lived, covering a mere eight years in a six-decade career and consisting of just three projects, only two of which were realised. Yet its impact on Hofmann’s subsequent work cannot be overstated.4 Hofmann’s mural work influenced the development of his slab paintings in a variety of ways: it introduced the artist to mosaic, the glistening, repetitive properties of which would appear in early, proto-slab paintings of the 1950s; it suggested the rectangle as a modular, stackable unit; it prompted Hofmann to think in architectural terms that informed the geometric underpinnings of paintings like Pompeii 1959 (Tate T03256); and it brought a new scale into his work. Considering the three mural projects in depth allows us to understand their influence on slab paintings such as Pompeii and to compare their related – but also divergent – approaches to space, scale and geometry. In his work on the Chimbote project Hofmann tackled the question of how to make modern art monumental and integral to the post-war city. The idea that modern art ought to occupy a central role in public life would inform his next two mural projects which, unlike the one for Chimbote, were eventually realised and remain extant today. But the Chimbote project also influenced the direction of Hofmann’s painting. 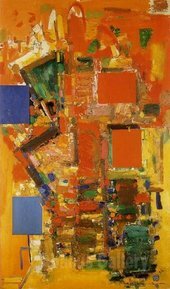 In the mid-1950s, as Clement Greenberg, Sam Hunter and many subsequent writers have noted, ‘small color bricks and mosaic[-like] pieces’ emerged in Hofmann’s paintings.11 In Towering Spaciousness 1956 (fig.7) – painted six years after the Chimbote mural proposals and as Hofmann was completing his first realised mosaic project at 711 3rd Avenue in New York – four clear rectangles emerge from a whirlwind of smaller, more irregular lines and dots, the mass of them glistening like the proliferating tesserae of a mosaic wall. Such works would eventually become the slab paintings of the later 1950s and 1960s – works like Pompeii. Furthermore, the scale and planarity of the large bell tower in the Chimbote designs prompted Hofmann to explore a more strictly geometric approach to colour areas. In his notes Hofmann wrote about creating an ‘architectural rhythm’ along the tower’s surface, ‘enlivened by shifting color planes of enormous dimensions’. These planes would function, he hoped, like ‘the small color areas function in a [work by Dutch modernist Piet] Mondrian’, against a ground of white, but at greater scale.12 In the slab paintings later in the decade, Hofmann would generally eschew a white ground but would continue to exploit the rhythmic and architectural properties of geometric colour. The result of the months of collaboration was Hofmann’s first realised mural: 366 square metres of vibrant colours and abstract motifs wrapped around the cube of the lift bank at the centre of the building’s lobby. From the street, tantalising glimpses of the mosaics glistened through the glass façade; inside, the oranges, yellows, reds and blues harmonised with the warm tones of the speckled, pink-hued floor and blue ceiling.16 The lift housing gave Hofmann two kinds of surface to work with: unbroken expanses of nearly 4.5 by 8.8 metres on the north and south walls; and, on the east and west, vertical strips interspersed with the silvery sheen of the lifts themselves. Hofmann designed a palette that gave each surface its own, dominating colour. On the north wall, blues provided a cool background for the wending motifs, while on the south, reds and oranges took over. These distinct colour swathes met visually on the east and west walls, where, turning their respective corners, they served as bookends to the lifts – red on one side, blue on the other. A column of bright yellow ran between the lifts themselves. Location of sketch unknown; photograph held in the Kootz Gallery Records, Archives of American Art, Smithsonian Institution, Washington, D.C.
Like the Chimbote mural, the mosaics at 711 3rd Avenue employ both organic motifs and solid, geometric blocks of colour. Yet they differ from the Chimbote design in several important respects. White, which played such a central role at Chimbote, is squeezed out in the lobby, reduced to small blocks or the role of silhouette for a particular motif. This is closer in approach to the proto-slab and slab paintings of the 1950s, in which white or neutral ground rarely makes an appearance. Furthermore, the rectangles, rather than standing out as singular, individual shapes as in the Chimbote mural, abut and overlap one another, creating a pulsing rhythm of colour blocks. Akin to the play of shapes in the slab paintings, the mosaic rectangles here overlap like stacked transparencies, and generate L-shaped blocks and stripes of colour in the negative spaces. The effects of this space-wrapping in Hofmann’s mosaic are particularly apparent when we compare his sketches to the finished work (fig.11). What is a diagonal braided motif in the sketch becomes, in three dimensions, an almost animate yellow squiggle, snaking its way down one wall and reaching around to the next. A straightforward set of repeating red ‘V’s is invested, in the lobby, with a syncopated rhythm as it slides over the ridge of the corner. These bending, folding shapes actively lead the viewer around the central cube, each motif bleeding into the next plane and pulling the spectator along with it. Completed a year before he created Pompeii, the New York School of Printing mural has several aspects in common with the painting, and with the other slab works that Hofmann was by then making in great number. The rectangle forms the organising principle of the mural, from the long, horizontal shape of the work itself to the many blocks and columns that mark its surface. As in the slab paintings, these rectangles abut and occasionally overlap one another, or leave slivers of negative space in between. The New York School of Printing mural also emphasises a contrast between the gestural and the geometric that characterises several of the slab paintings, particularly Pompeii, with its fluid, aqua-blue passage and murky dark reds. Hofmann and Foscato, his mosaicist collaborator, imitate the textural quality of loosely brushed oil paint in several places in the mural, most notably in the tall blue and white column near the centre, in a small powder-blue square a few feet to the right (fig.14) and in a green rectangle at the far right edge (fig.15). 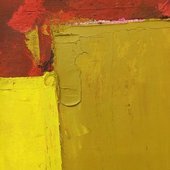 In Pompeii, similarly, rectangles of pink, yellow, red and mustard float like pure Euclidean forms with knife-sharp edges, while below, painterly areas disturb the canvas’s rectilinear environment. 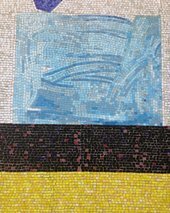 We might also speculate that working on the mosaic murals gave Hofmann a new sense of the tactility and weight of two dimensions. The proposed Peruvian bell tower, conceived as a plane, would still have taken up space, its colourful front backed by several inches or feet of physical mass. In Pompeii the painted rectangles are themselves built up into slabs: the central yellow block is raised like a low relief out and away from its neighbours; at the left edge, two panes of red and magenta rise up like upper and lower lips to meet one another (fig.16); near the top, an extra smear of mustard yellow, slathered on with a palette knife, adds yet another hillock of thickness to an already weighty rectangle (fig.17). In the end, the most significant difference between Hofmann’s murals and his slab paintings lies in the way they shape the space beyond their borders. The mural on the façade of the school building is more than just a planar composition: it also condenses the vastness of the edifice into a concrete strip of colour, exerting a visual pull on the spectator who approaches from across the street. At the plaza in Chimbote, the bell tower would have energised the void of space rising off the ground, which, with a slab slicing through it, would have come to assume a palpable quality. As Hofmann observed in his notes from this time, ‘A good easel painting has the faculty of assimilation with any environment. But the mural painting must predominantly serve an architectural purpose – it must not contradict the architectural idea’.31 In the three mural projects of the 1950s, Hofmann investigated how to unite colour and form with the ‘architectural idea’ of a given space, unfurling his abstractions over façades and walls and wrapping them around architectural cubes.32 These works did not merely ‘assimilate’ themselves into a given environment, but instead actively conditioned it, transforming the very space around them. 1. Hans Hofmann, ‘The Search for the Real in the Visual Arts’, in The Search for the Real and Other Essays, ed. by Sara T. Weeks and Bartlett H. Hayes, Cambridge, Massachusetts 1967, p.66. 2. ‘In the Galleries: Hans Hofmann’, Arts Magazine, February 1960, p.57. See Indian Summer 1959 (University of California, Berkeley Art Museum and Pacific Film Archive, Berkeley) and Cathedral 1959 (Museum of Modern Art, New York). 3. On the Kootz exhibition, see Emily S. Warner, ‘Marketing the Monumental: Wall Painting at Midcentury’, Archives of American Art Journal, Autumn 2017, pp.26–49; and Eric Lum, ‘Pollock’s Promise: Toward an Abstract Expressionist Architecture’, Assemblage, no.39, 1999, pp.63–93. 4. 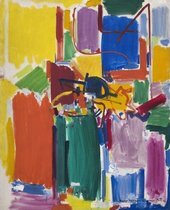 On this topic, see especially Kenneth E. Silver, Walls of Color: The Murals of Hans Hofmann, Greenwich, Connecticut 2015, pp.61–5; and Tina Dickey, Color Creates Light: Studies with Hans Hofmann, Salt Spring Island 2011, p.312. 5. The Hofmann murals for Chimbote have received a good deal of scholarly attention. See Xavier Costa (ed. ), Hans Hofmann: The Chimbote Project: The Synergistic Promise of Modern Art and Urban Architecture, Barcelona 2004; Michael Rush, Hans Hofmann: Circa 1950, Waltham 2008; and Mary McLeod, ‘The Chimbote Civic Center: “A Meeting Place for the People, … A Meeting Place of the Arts”’, in Silver 2015, pp.71–93. 6. 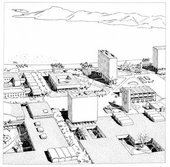 Josep Lluís Sert and Paul Lester Wiener quoted in The Muralist and the Modern Architect, exhibition catalogue, Kootz Gallery, New York 1950. 7. Josep Lluís Sert, Fernand Léger and Sigfried Giedion, ‘Nine Points on Monumentality’ , in Sigfried Giedion, Architecture, You and Me: The Diary of a Development, Cambridge, Massachusetts 1958, p.48. 10. Hans Hofmann, untitled typescript, 25 November 1950, p.5, Hans Hofmann papers, Archives of American Art, Smithsonian Institution, Washington, D.C., box 7, folder 4. 11. Sam Hunter, Hans Hofmann, New York 1963, p.28. 12. Hans Hofmann, ‘Chimbote Mural’ , Samuel Kootz Gallery Records, Archives of American Art, Smithsonian Institution, Washington, D.C., box 1, folder 34. 13. According to Tina Dickey, Kootz reached out to William Lescaze, the building’s architect, around 1954. The contract for the mural was signed in June 1955. See Dickey 2011, p.312. 14. Hofmann quoted in Dore Ashton, ‘About Art and Artists’, New York Times, 16 February 1956, p.38. 16. The color scheme of the lobby has since been redone. 17. Cynthia Goodman, Hans Hofmann, exhibition catalogue, Whitney Museum of American Art, New York 1990, p.70. 20. Tina Dickey in particular connects the office lobby experience to the development of the slab paintings. She notes that Hofmann’s assistant James Gahagan created the painted rectangles, but intended them only as temporary placeholders. Hofmann, however, ‘insisted that the papers remain part of the composition’. See Dickey 2011, p.313. 21. Samuel Kootz, letter to Hans Hofmann, 14 August 1956, Hans Hofmann papers, Archives of American Art, Smithsonian Institution, Washington, D.C., box 2, folder 76. 22. Gene Currivan, ‘Stone is Placed at Print School’, New York Times, 18 January 1957, p.22. 24. ‘Tokens of Art in City Schools’, Progressive Architecture, April 1959, p.147. 25. William Kaufman and Jack D. Weiler, ‘711 Third Avenue. Preview of Mosaic. Designed by Hans Hofmann’, pamphlet, April 1956, Samuel Kootz Gallery Records, Archives of American Art, Smithsonian Institution, Washington, D.C., microfilm reel 1320, frames 992–5. 26. Hofmann quoted in Ashton 1956, p.38. 27. ‘Color and Art Help an Office Building’, Architectural Forum, October 1956, pp.154–5. 28. Jules Langsner, ‘More About the School of New York’, Arts and Architecture, May 1951, p.20. 29. Hans Hofmann, letter to Architectural League of New York, November 1958, Hans Hofmann papers, Archives of American Art, Smithsonian Institution, Washington, D.C., box 1, folder 21. ‘I am not really a mural painter’, he wrote in his note, ‘and do such work only casualy [sic] when such demands come through the gallery which handels [sic] my work’. 31. Hans Hofmann, untitled typescript, 25 November 1950, p.3, Hans Hofmann papers, Archives of American Art, Smithsonian Institution, Washington, D.C., box 7, folder 4. 32. Hofmann may have also designed a fourth mural, in 1955, for an apartment; see Silver 2015, p.49. 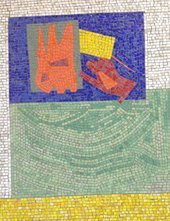 On Hofmann’s murals, see also Tina Dickey, ‘A Decisive Moment: Hofmann’s Mosaic Murals’, in James Yohe (ed. ), Hans Hofmann, New York 2002, pp.270–5; and Dickey 2011, pp.312–16. Emily Warner, ‘Slabs and Walls’, in Emily Warner (ed. 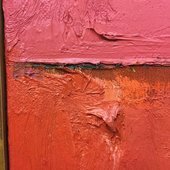 ), In Focus: Pompeii 1959 by Hans Hofmann, Tate Research Publication, 2018, https://www.tate.org.uk/research/publications/in-focus/pompeii/slabs-and-walls, accessed 24 April 2019.